Two new cases of Ebola have been recorded in the Sierra Leone capital Freetown, weeks after the city was thought to be free of the disease. Health officials say there are fears of further infections as the cases occurred in a densely populated slum. Sierra Leone's National Ebola Response Centre said there was great concern because all Ebola quarantine facilities in Freetown had been closed. West Africa is recovering from the deadliest Ebola outbreak in history. More than 11,000 people have died since December 2013. The latest cases were found in the Freetown slum of Magazine. 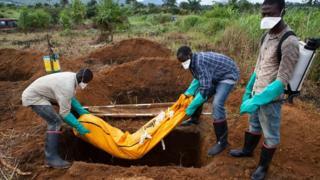 The north of Sierra Leone continues to be affected by Ebola, as does neighbouring Guinea. Liberia, the other country affected by the recent outbreak, was declared Ebola free in May after 42 days without a new case. Last month, six people were put in isolation in prison in Guinea after being accused of travelling with a corpse of a relative who had died of Ebola.